Sams and Coffee keeps it simple and flavorful. Simple, clean, effective. These are qualities restaurant-owner Jacob Miller wanted to ensure his newest venture, Sams and Coffee, possessed. 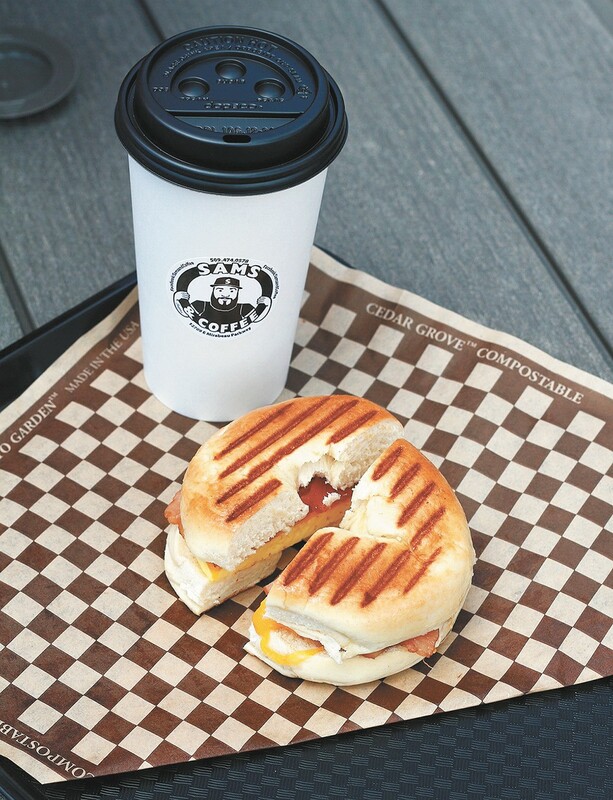 The newly opened shop in Spokane Valley is cranking out hearty sandwiches, wraps, salads and specialty espresso drinks for the business people of a commercial area surrounding Mirabeau Parkway, and any passersby with a craving. Offering lunchtime favorites in a minimalist, industrial space, Miller's original vision is clearly reflected in the shop. "I just wanted it to be clean," Miller says. "[When] you walk into a restaurant and a sandwich shop and it's kind of dingy, you're reading a book by its cover. We're gonna give you a clean slate to not have to worry about anything else." Miller is no newbie to the restaurant industry. He's mastered aspects of the food biz far and wide, starting as a dishwasher at a Boston's Pizza and proceeding to work as a line cook, bouncer, bartender and everything in between. In addition to Sams, he also owns Crave, a sports bar in downtown Spokane. The name Sams and Coffee pays homage to Miller's middle name but is also a bit of wordplay, "sam" being short for sandwich slang of "sammich" or "sammy." Though many restaurant owners come up with a concept before choosing a location, Miller said his experience was the opposite. He knew there were people in the business park on Mirabeau Parkway who didn't have many options for lunch. "I just wanted to offer them a good option of food that is different than what they've had so far, and closer, within walking distance," Miller says. Sams' menu offers standard favorites like an old fashioned tuna sandwich ($9.95), grilled cheese ($6.95) and a club sandwich ($10.50), but Miller wanted to make sure the menu had more than plain old cold cuts. Some of the more adventurous choices were influenced by his favorite dishes from around the world. "The menu started off with things that I've liked in my travels," he says. The Cuban sandwich ($10.95), inspired by a trip down South, is a combination of ham and pork piled high on grilled ciabatta, served with mustard and pickles. Sams also offers several substantial vegetarian options including a hearty veggie sandwich ($8.95) with greens, tomato, red onion, avocado and cheese smothered in balsamic dressing. Coffee lovers can also find something to enjoy at Sams through its full espresso bar. Though Miller has had no formal barista experience, he draws coffee inspiration from his bartending work at Crave, where staff specialize in making funky drinks. "We call ourself flavor magicians," Miller says. With that kind of magic, Miller and the barista at Sams collaborate to come up with daily specials like "Jake's White Angel," ($3.95) a concoction of white coffee (coffee beans with a lighter roast resulting in a mild, nutty flavor) and white chocolate, vanilla and toasted marshmallow syrup. Though the blend may sound too sweet, the combination of flavors compliment each other surprisingly well. Daily coffee and sandwich specials are advertised on the shop's social media pages and in store. The original print version of this article was headlined "Business Casual"